Patios or Decking make a perfect extension to your living space and with the availability of outside lighting and patio heaters, they can be used all year round. A professionally designed and constructed patio will enhance your garden, giving a feature area to entertain friends and family. Using our experience and knowledge of the variety of materials available, we work with you to develop a design that creates a patio that will provide many years of pleasure. This is becoming more of a popular option for people, wishing to keep their gardens tidy and attractive, but have very little time to carry out the regular maintenance needed to keep a more traditional style garden. 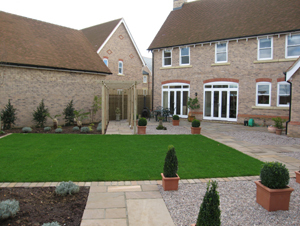 Easy maintenance style gardens are used to reduce the amount of time required to keep the garden areas looking good. 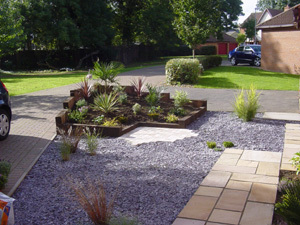 Gardens can be designed to give a new dimension to your front or rear garden areas, creating raised beds, slate or decorative gravel areas, supported with selective planting, rocks and pebbles. Autumn Gardens has a depth of experience in the development of low maintenance gardens, working with customers to develop their ideas, advising on types and styles of materials that are available. Timber Decking has become a popular addition to many homes, creating a comfortable leisure area connecting home and garden. Decking blends with all types of gardens, and a design can be tailored to suit all sizes and budgets. Whether you prefer an elevated deck, freestanding, or small intimate deck beyond your French or patio doors; you choose. It’s like adding another room to your house. It can utilise an uneven or sloping part of the garden that otherwise may not be possible to develop. Decking can be an excellent alternative to using paving in the garden, giving the garden a modern, contemporary feel. It can be designed to suit most areas and personal tastes. Autumn Gardens build decks, creating a solid base structure to sit the deck frame on. Our framework and deck boards are screwed together; not tacked together by staple gun. Your deck can be complimented with decorative handrails, balustrades and creative lighting, to make it a special feature.